Arab Academy is a prestigious Arabic Language Institute that offers rigorous Arabic immersion programs to develop students’ fluency in Arabic and cultural understanding in the shortest amount of time. Top universities and high schools around the globe send their students to Arab Academy in Cairo to study Arabic language and become immersed in Middle Eastern culture. Intensive Arabic courses over one semester, a full year or a summer program are all available. We can design a customized study abroad program in Egypt for your students as well. During each semester, a full-time intensive Arabic course load normally consists of 4 hours of class per day 5 days a week for a total of 16 semester units. Students normally take courses in Modern Standard Arabic and Egyptian Arabic. We supplement some Arabic courses with integrated cultural outings during and outside of class time with teachers, as well as hands-on cultural activities like cooking and calligraphy and lectures by Egyptian experts in a variety of fields. Students at all levels from beginner to advanced focus on the language with courses in Modern Standard Arabic, Egyptian Colloquial, Media Arabic and Business Arabic. Universities look to Arab Academy to develop and provide customized study abroad programs in Arabic language and culture. The ability to communicate in Arabic gives foreign residents of Egypt the skills and confidence necessary to make life here easier and better. They achieve better performance at work by improving communication with Egyptians they deal with at the office or worksite. Learning Arabic in Cairo is a great opportunity to develop the skills you need to thrive everyday challenges from hailing a taxi to negotiating a big contract. 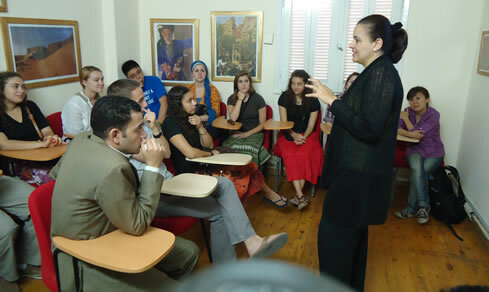 Arab Academy offers flexible courses for expats, either in Modern Standard Arabic or Egyptian Colloquial. Our services are used by private companies, government agencies, and international organizations in Cairo and beyond. Increase the productivity and competency of your non-Egyptian staff with custom Arabic language programs taught at your site by our expert instructors. For companies with a small number of foreign employees, you can enroll your staff in small group and private courses in Egyptian Arabic, Modern Standard Arabic and business Arabic in the morning, afternoon and evenings in centrally located Garden City.